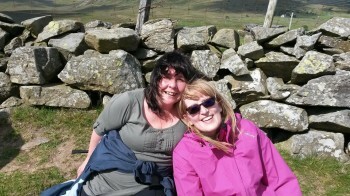 A very big thank you to Tracey Hardman and Anita Hulme who did a sponsored walk to raise funds for us. 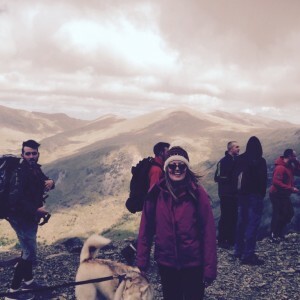 They walked up Snowdon on Saturday 6th June! Tracey’s Mum and Dad, Jeff and Julia recently adopted Roxy and Phoebe from us and Anita adopted Louis from us a while ago. The dogs are loved so very much by their families and friends and so with this in mind Tracy and Anita wanted to support Cheadle & District Animal Welfare Society by raising money through sponsorship for their walk. They joined another group of ladies that had done the walk before and walked up via the Llanberis Path which is 10 miles there and back, 1150 Metres from the start to the top. They did it in 6 hours in total! The terrain was quite tricky and challenging, but the views as they walked up Snowdon were absolutely stunning and they couldn’t wait to get to the summit for the amazing views they had been told they would get once up there. Unfortunately the café on the Summit wasn’t open, because the train wasn’t running that high (which is how the staff usually get there) due to the high winds, which were approximately 97mph and were, of course their biggest challenge! 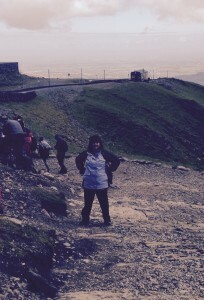 When they did reach the top of Snowdon, they were among black clouds, so that meant that along with not being able to have a warm drink and snack from the café, they also didn’t get to see those stunning views. The feeling of achievement once at the top, was overwhelming and all shed a few tears whilst they thought about why each had taken this challenge on, plus the sheer elation of what they had achieved. Since they have returned from their walk up Snowdon, they have had a few aches and pains, but ‘nothing that you wouldn’t expect’, they said. They enjoyed it so much so, that they are now looking forward to doing it again in the summer, when they will hope to see those breath taking views and have that drink and snack from the café! Thanks to the kindness of all who sponsored them they have raised an incredible £331 for the Society. We can’t thank them enough for their great effort as well as the generosity of their very kind sponsors. We really appreciate this brilliant donation as well as their ongoing support.